"All Welding Shall Comply with AWS-D1.1"
I am a welding instructor/inspector. I have a business client that builds control panels and a potential client of theirs is requesting that they conform to AWS D1.1 standards on a control panel. Seems odd to me what the customer is wanting? Does or can a company become AWS D1.1 certified? Is there a certain process they have to go through to become a D1.1 facility? I tested some of their welders over a year ago to the sheet metal code. Looks like they would want them to conform to D1.6-Structural welding Code - Stainless Steel? Thanks for any help. I got your name from practical welding. Let’s dispel a few myths: Companies are not AWS-D1.1 “Certified” or “AWS-D1.1 facilities”. They simply comply, or they do not, and they call on folks like you and I to insure that. It’s not uncommon for contract documents to call for compliance to AWS D1.1 when the work being requested falls outside the limitations of AWS D1.1. The code is so accepted throughout industry that often those calling it out are unaware of its requirements. It has become some-what of a “Boiler Plate”. The D1.1 committee recognizes this. If you look to the Limitations of D1.1 noted in Cause 1 at 1.2 it states, “The code may be suitable to govern structural fabrications outside the scope of the intended purpose.” It then goes on to state that the user may be better off looking into the requirements of other D1 documents that are more practical for your application (I used a little creative liberty in that last line). In your case, AWS D1.3 and AWS D1.6 are far more applicable. 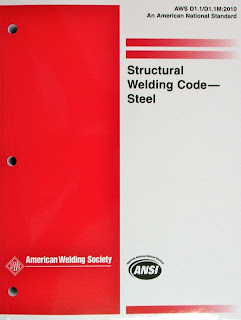 Focusing your procedure and welder qualification on these codes will (a.) comply with AWS D1.1 and (b.) save your company, or the company you are working with, boat loads of money. You could certainly review the job requirements and develop the requirements to AWS D1.1, but you would find yourself doing PQR’s and Welder Qualifications that may not have been required if you had used the Pre-Qualified procedures laid out in AWS-D1.3 and AWS-D1.6. Using documents like AWS-D1.2, D1.3, D1.4, D1.5 and D1.6 when your welding doesn’t quite fit in a D1.1 box is certainly considered acceptable when your contract documents read, “All welding shall comply with AWS-D1.1”.